Jaguars in the wild are solitary creatures.But it's just the opposite at Jesse Bethel High School, whose Jaguars roared together Thursday one last time. "The four years have gone by much faster than we imagined," senior class president Nancy Nguyen said, shortly before she asked her 400 or so classmates to turn their tassels and officially become alumni. In a show of camaraderie, the entire class sang Katy Perry's "Fireworks" at the start of the proceedings. Like at the Vallejo High School graduation the previous day, the commencement ceremony at a packed Corbus Field featured nods to the last of the Hogan High Spartans to graduate. Hogan High School was closed two years ago, dispersing its remaining student body between Vallejo and Bethel. 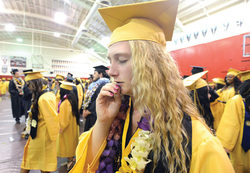 Principal Linda Kingston and Superintendent Ramona Bishop encouraged the Class of 2013 graduates to follow their dreams. Bishop invoked the spirit of the late Jesse Bethel, the city's first African American school board president and the first black chemist at Mare Island Naval Shipyard. "His dream was to change the world in service to the community," Bishop said. Kingston added that the Class of 2013 is a group that knew how to take risks in search of success. "Dream big, and make those dreams happen," Kingston said. Advertisement also attending the school. "I am what I am because of them," McClinton said, adding that her older brother, now a Marine, had flown back from Japan to see her graduate. Valedictorian Sukhranjan Nijjar expressed pride at what she and her fellow classmates have accomplished and also encouraged them to follow their dreams. "Don't worry what people say behind your back because they're behind you for a reason," Nijjar said.